A couple of inky mistakes for Tuesday | Inkdependence! I have a bunch of inks to show you, but I discovered a couple of pens with mild issues yesterday, so I figured I'd start the week off with them. First up, I had a Wing Sung 233 loaded with Diamine Meadow. I used this pen for a bit, and then I put it away for a week or so. I opened it up yesterday, and this is what I found. This funk was probably caused by my not quite closing the cap. I don't remember it being open, but it must have been. This is the sort of thing that happens when a low-viscosity ink seeps into the feed and nib while evaporating. It looks kinda wild, but it cleaned up easily. Here's a picture of the ink in action. It's the green ink in the middle of the page, and it's the only picture I have of this ink. Check out a full review of Diamine's Meadow here. This next picture is of something far more annoying. 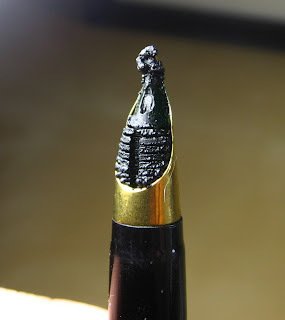 This is apparently what happens when you let Diamine Washable Blue dry out in your Hero's ink sack. As you can see in the link, this ink is a really mild blue. I never did a writing sample with this ink, but it's a pretty blah sort of light-ish blue. I don't know why it turned purple, but it did. This stain appears to be permanent, so watch out, all you folks with clear demonstrators. This one isn't as washable as advertised. Those ink sacs get discolored by the first ink I use in them most of the time. I think they're a really stain-able material. I get the Diamine crud (I don't know of another brand with inks that do this) with Kelly Green, and I think one of the oranges like perhaps Blaze Orange is also notorious for it. As you say, it cleans right up. When a cartridge (since I re-use them) stained like this, I put a few drops of household bleacher to water. I fill the cartridge with that water and wait for a day. And it works really well. Yet, I am not sure about sacs. Drawings and a pen list and a calamity. Check out Lee Smallwood's blog.